The Conservation Conversation: Science, policy and making your mum proud. Whether you’re delighted or horrified by the UK general election result, the new government represents the collective will of everyone who put a cross on a piece of paper on May 7th. Apart from voting at elections and sending the odd campaign letter to my local MP I do little to involve myself with how government makes decisions. In fact I didn’t know there was much more I could do. Turns out, the government wants to know what we think, they even take time to ask us through policy consultations. Organisations of many types will perform open consultations related to their function. Government in particular, whether amending, proposing or implementing legislation, will ask both the general public and issue specific stakeholders to provide information or opinion on the subject in question. A consultation could take the form of a simple tick box questionnaire, an open question on the suitability of a policy or perhaps a long list of questions requiring specific or specialist knowledge. The completed responses will then be logged and in theory, will influence the policy, strategy or decision being made. Consultations are a widespread, legitimate and accessible mechanism for communicating viewpoints to policymakers. Of course, you could get so excited by the wonderful democratic process of policy consultations that you start writing letters to government in your evenings and weekends on every issue that arises (I think some people do!). But as scientists it’s probably even more powerful to engage with these consultations where they cross over with academic expertise. However, adding another report to the “to-do” list of a modern academic is likely to go down like a tonne of bricks made from the blood and tears lost during countless unsuccessful grant applications. So what are the benefits of responding to government consultations for academics? Research is often publically funded, joyfully sharing the expertise you’ve gained to further democracy, is not only likely to put a spring in your step, but is also ethically responsible. If such altruistic motivations don’t move you, funders often want to know what your “impact” is; what better way to show them than through involving yourself with government policy. Trying to make “impact” by turning each academic publication into a policy brief is difficult and doesn’t always make sense; you can use your expertise more broadly by responding to policy consultations. Being an academic comes with a lot of freedom compared to other work environments where you have to check public responses against everything the organisation has ever said or stood for; make the most of that. Replying to consultations as an academic will expand your skills outside the standard grant-research-publish cycle and will look great if you ever want to make a career switch. Who knows you might make such a name for yourself that BBC radio 4 starts calling you early in the morning for an “expert opinion” and you’d make your mum really proud. But how much of an expert do you have to be? Obviously the better known you are, or the larger the group you represent, your voice will probably be louder. However, everyone has to start somewhere and there’s no reason why PhD students can’t respond to consultations in the broad area of their expertise. Start small and build confidence or consider joining a specialist group where you can get experience by commenting on responses that others are leading on. Perhaps in the future we’ll share some consultation responses than we’ve been working on here a STICS. In the mean time you can have a go at responding to a public consultation from the EU; It’s titled the “fitness check” for EU Nature legislation (otherwise known as the Birds and Habitat directives) and takes the form of a 15 min questionnaire that you can either fill out in full or with a bit of help from the RSPB. 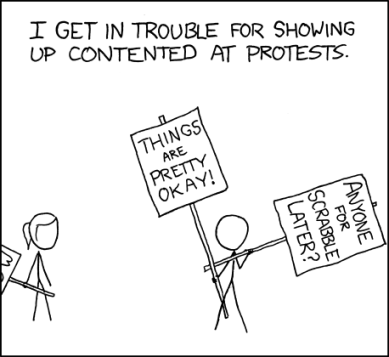 And if you don’t think government needs to be told anything and it’s all going swimmingly, this little XKCD comic is for you… The Conservation Conversation – an initiative of STICS – is an informal lunchtime discussion on topical issues held on the last Friday of every month. For more information contact Emma Bush (e.r.bush@stir.ac.uk).